At Porter Tree Services our owners, Charlie Rodgers and Chuck Porter, have more than 45 years of combined experience in the tree and landscaping services industry. We are licensed by the Maryland Department of Natural Resources as a Tree Expert Company and also licensed by the Maryland Department of Agriculture for tree and shrub fertilization and health care. We believe in treating every job with the utmost care and attention. Our Company Motto; “We take pride in our work” is a statement that guides every job and interaction we have with our customers. Our goal is to provide safe, quality tree care services. Our crews have extensive training in all aspects of tree removal and care and take all necessary precautions to ensure the highest degree of safety and satisfaction. 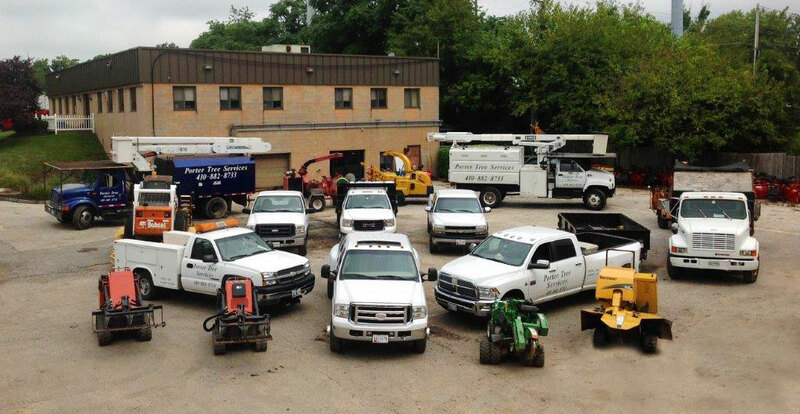 We provide a wide range of services to address both tree emergencies and routine maintenance. We perform routine stump removals as well as tree pruning. In addition to these types of services, we can also set up a regular monitoring program for our customers to inspect trees and protect them from disease and damage. Our tree treatment programs also include fertilization to help maintain the health and beauty of your trees. Our motto: “We take pride in our work” can be observed in every aspect of our tree removal process. We believe in leaving our customers with a thorough job which includes carefully removing the tree and its stump as well as cleaning the area and hauling away all remaining debris. We fill the void left by the stump with topsoil, plant it with grass seed, and cover it with straw. Our customers can rest assured that all unsightly debris will be removed and replaced with a newly seeded turf area. The pride we take in our work extends to our relationship with our customers. Every employee at Porter Tree Services is taught to communicate effectively with each other and with our customers. From the very first contact you have with us, to the final day of clean up on your property, we strive to keep you informed and listen to your individual needs. If you have questions about our services, or would like to schedule a site visit, please call us today at 410-882-TREE (8733).